Parkin was retained by The Ottawa Hospital (TOH) to conduct a review of both the General Site, Special Care Nursery; and the Civic Site, Special Care Nursery. A significant condition at the General site is that all the babies are in large rooms, resulting in an absence of noise-control separations between care areas; in addition, these rooms have no acoustically attenuating materials and no individual lighting controls. Evidence-based medical research carried out by Dr. Stan Graven and Dr. Robert White, both US neonatologists, has shown that premature infants’ development is negatively affected by exposure to excessive noise and light. 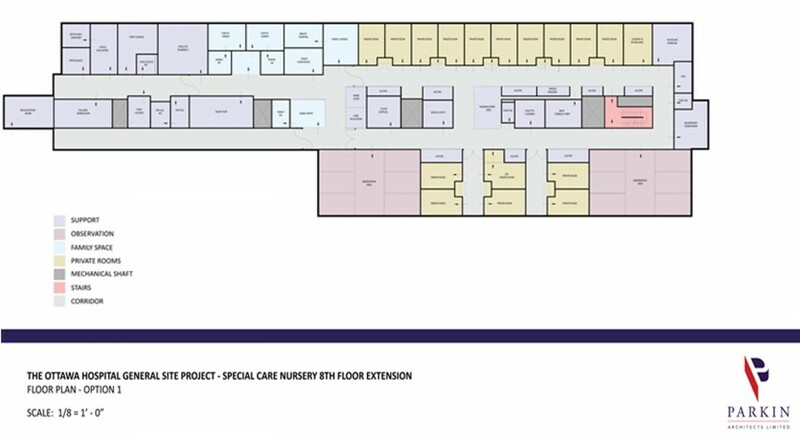 TOH commissioned Parkin to design a new Special Care Nursery at the Civic Site, designed with highly noise-absorbent ceiling tiles, resilient flooring, acoustic wall panels and individual lighting controls. The sickest babies will also have their own individual rooms. The new unit will open in 2017.